On Tuesday, the Boston Red Sox arrived on the West Coast to play the red-hot Los Angeles Angels winners of seven straight and proceeded to outscore their hosts 19-1 in an 18-inning stretch. On Tuesday, the Red Sox won 10-1 and on Wednesday the score was 9-0 in favor of Boston. With the two wins, Boston became the first team in the last 15 years in Major League Baseball to begin the season with 15 wins or more in their first 17 games played. When asked if the season was too young to call his team the best in baseball, new outfielder J.D. Martinez answered, “Yeah,” He said his Red Sox had started off very strong, but ask him in July. 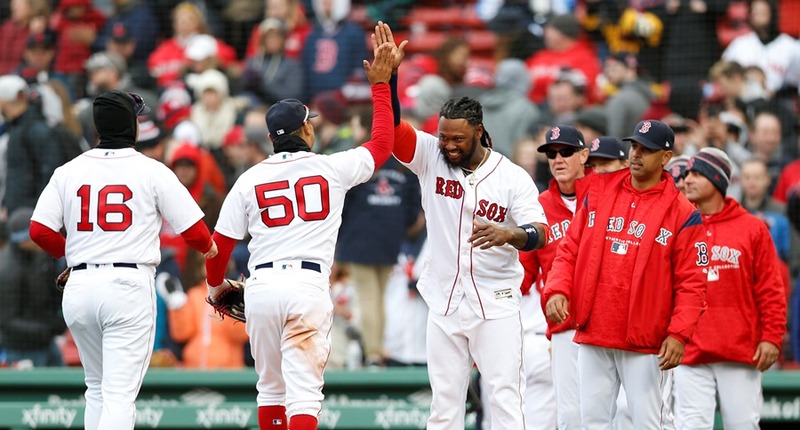 Nevertheless, the Red Sox are solid on defense, have depth offensively to go along with a starting rotation of star pitchers and a bullpen that can lockdown batters. Thus far Boston is leading the majors in runs per game at 6.35, run differential at plus-60, and ERA for starters of 1.91. On Tuesday, the Red Sox hit six homers, three of which were by Mookie Betts. They hit another three Wednesday, including a Rafael Devers grand slam, his second straight game with a home run. Shohei Ohtani the starter for the Angels on Tuesday needed 66 pitches to post six outs and on Wednesday Angels’ starter Tyler Skaggs needed 60 pitches to post seven outs. By the end of three innings, Boston was ahead 6-0 and starting pitching for the Red Sox Rick Porcello easily pitched six innings allowing six hits with no walks as the Red Sox moved their record to a major league leading 15-2. Boston is now just the seventh team to begin the season 15-2 or better since 1920 and the last since the San Francisco Giants in 2003. What might even be more impressive is that Red Sox manager Alex Cora is a rookie manager in the majors. In nine of Boston’s last 10 games, they have scored four or more runs in at least one inning. Over the first 17 games to open the season, Boston hitters have hit four grand slams, after not hitting any through the entire 162-game regular season last year. Boston has scored 84 runs over their last 10 games played, while Red Sox pitchers have allowed three or fewer runs in 14 of their 17 games including six straight. There are another 145 games to be played in the regular season, but the Red Sox are off to an incredible start.